In the past couple of years, the big news in personal watercraft has been small. It has never been easier to get onto the water in a new PWC. First there was the 2014 Sea-Doo Spark, with new materials, efficient smaller engines and a price tag that starts at about $6,000. After several years of launching ever-bigger, more powerful and more expensive watercraft, BRP took a sharp turn in a new direction with the Spark. It is reminiscent of the sit-down watercraft that got the PWC revolution rolling more than a quarter of a century ago. It’s also been a big hit. Yamaha launched its own new back-to-basics PWC last year: the 2015 WaveRunner V1 Sport. 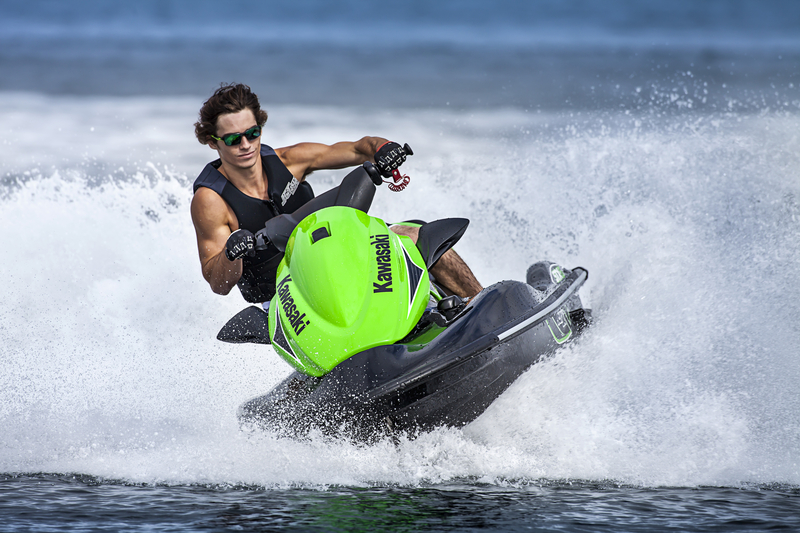 Including Kawasaki’s Jet Ski STX 15F in the mix, each major watercraft manufacturer now has a price-point PWC. That’s good news. To be truly accessible to young people and families, boating has to be affordable. With three builders offering unique entry-level PWC, the sport and pastime is more attainable than ever. A very well-equipped 3up Spark prices out at under $10,000 while Yamaha’s V1 Sport lists at $10,199 and the Kawasaki STX-15F has an $11,299 price tag. All have capable four-stroke engines with electronic fuel injection. 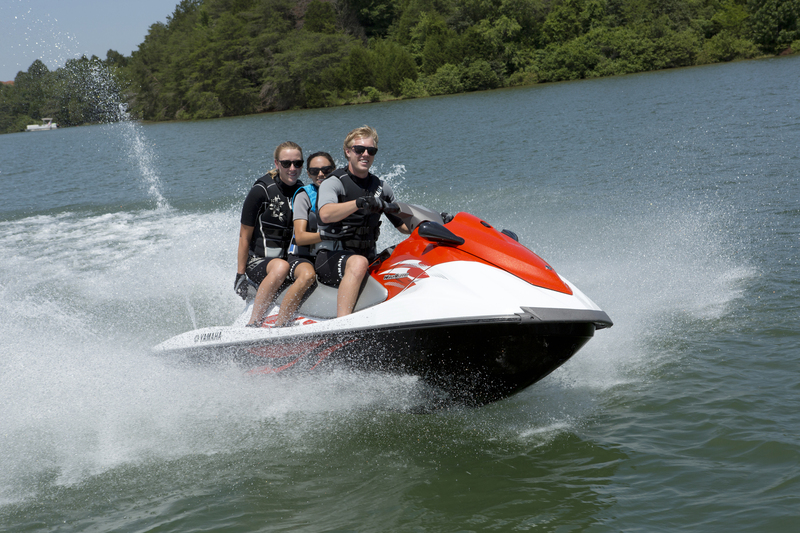 The 2015 Yamaha V1 Sport is the newest of the entry-level fleet and answers the challenge of the Spark with a three-passenger PWC, powered by a proven 110-hp 1,052-cc four-cylinder four-stroke engine. Unlike its larger WaveRunner stable-mates, the 10’7” V1 Sport is built of sheet-moulded compound (SMC) a composite polyester and fibreglass material that comes in sheets and is pressure-moulded during manufacturing. The result is a lightweight, but strong hull that can be built at a lower cost than traditional fibreglass hulls. The 10’3” Kawasaki STX 15-F has a more traditional laminated fiberglass hull and a proven powerplant – a 1,498-cc four-cylinder four-stroke – that pumps out 160 hp. It has the biggest price tag, but is also the entry-level horsepower leader. The STX 15-F Jet Ski also comes with standard reverse, rear-entry step and digital instrumentation. The hull’s styling is sleek and attractive but has room for a large storage compartment and 62L fuel tank. The Sea-Doo Spark, for its part, takes new approaches in power, technology, materials and options. Its hull is built of a high-strength compound called Polytec – polypropylene and long glass fibres — in what BRP calls a minimalist Exoskel design. The Spark is the smallest in the entry-level fleet, ranging from the 9’2” 2up version to the 10-foot 3up machine. But the Sparks’ light weight and hull design deliver sporty speed and handling with a pair of 899-cc engines: the 60-hp Rotax 900 ACE, standard in the 2up and the 90-hp Rotax 900 HO ACE, standard in the 3up Spark and optional in the 2up. The Spark really shines, though, in its large range of factory-installed options that let buyers choose their own handling, convenience and performance features as well as colours and styling. That level of customization appeals both to cost-conscious families and image-conscious young people. BRP also has a wide range of Spark-specific accessories. With all these options, it has never been as simple, as economical or as much fun to enjoy the PWC boating lifestyle. This article is featured in the Summer 2015 issue of Boats&Places. Next articleWhat’s New in Watersports?